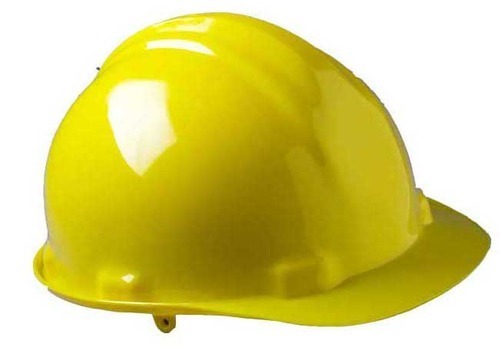 To meet the requirements and necessities of the customers, we are providing a wide series of Tough Hat Helmet. These products are manufactured under the strict inspection of industry certified experts, who have years of experience of this realm. Moreover, quality controllers also check these products on industry parameters to ensure the quality. Due to their longer service life and sturdy nature, these products are highly employed by patrons. Higher Impact resistance ensures higher Safety. 'Saviour’ Tough Hat Helmets are made out of Virgin Grade UV stabilized HDPE material resistant to Impact, Heat and Chemicals. The weight of the Helmet does not exceed 325 Gms. The inner dimensions of the shell are between 520 to 600 mm. They incorporate Ergonomic design for comfort of user and come with special structure brim design.They are provided with 6 point suspension made out of virgin grade LLDPE Material with adjustable Nape Strap for user adjustment. It comes with a Chin strap of 19 mm width for proper fitment onto the shell and Head . Sweat Band made out of soft PU material is compatible to Skin and comes with high absorbent properties for maximum sweat absorption. Sweat Band is designed for snug fit to the forehead for maximum comfort and adjusts to contours of different users. The Tough Hat Shell has a universal slot on both sides of the outer brim for fixing of accessories like Ear Muff, Face Shield etc. Chemical Splash goggles can also be clipped on without drilling holes. It has provision for Printing of Company’s Logo on the Front side. Colours Available in Red, Yellow, White, Blue, Green. All Industrial segments demanding complete Head protection both Indoor and outdoor Operations like Erection / Commissioning / Fabrication – Laying of Pipelines etc. Mechanical Engineering workshops Construction Industry Maintenance and Operations Inspection and Surveillance Automobile and Mechanical Fabrication Shops. Complete Head Protection with comfort of wear Higher Impact resistance ensures higher Safety. Design ensures ease of wear and more Ergonomic comfort with special structure brim design. Soft Sweatband ensures adjustment to head contours for ease of wear and absorption of sweat ensuring comfort to the wearer. Adjustable Chin strap ensures proper fitment ensuring higher Safety. 6 Point Suspension ensures uniform fitment and user comfort with all round safety. Universal slot on both sides of the outer brim for fixing of accessories like Ear Muff, Face Shield etc. Chemical Splash goggles can be clipped on without drilling holes.Certification Compliances ensures dependability of the product.